We do not expect children to have life limiting medical conditions — but tragically, some do. The Mariposa Program of UNMH is designed to assist families facing such a challenge. This year marks the 13th anniversary of the Mariposa program. We started as a small group of people that wanted to do something to make the issues of caring for a dying child easier than it was at that time. Mariposa provides a team of experts that include MDs, RNs, social workers, chaplains, home health aids, Child Life, and volunteer services. We offer home care hospice for infants up to age of young adults. Included in their care are medications, medical supplies, other therapies, social services, and bereavement services. All care is provided in the patient’s home or place of residence. The program serves not only the child, but supports the entire family, including parents and siblings. An individualized plan of care is designed to meet the specific needs, hopes and goals of each patient and his or her family. The plan addresses the medical, nursing, psychosocial, and spiritual needs of the patient and family, and is carried out by a team of highly trained professionals. The Mariposa Program emphasizes quality of life rather than length of life, and uses whatever time is available to provide spiritual and emotional support to the patient and family. To be involved in their child’s care. To receive support in decision-making. To know that their child’s pain and symptoms are being controlled. To maintain continued involvement and support from their child’s primary care physician. To receive ongoing education and consistent communication about their child’s condition. To have a written care plan individualized to meet the unique needs of the child and family. To know that psychosocial and spiritual support is available. Parents want what is best for their children. Often, however, decisions about what is in the child’s best interest are made during extremely emotional and stressful situations. A skilled and compassionate interdisciplinary team — working in conjunction with patients and their families — can guide and support families in their decision-making process, and help parents remain active in all aspects of their child’s care. The Mariposa Program believes that care of the child should be guided by the needs of the child and family. An individualized plan of care is designed to meet those specific needs and to help fulfill the hopes and goals of each patient and family. Home visits from team members, including a nurse to provide skilled nursing services, a social worker to provide counseling and assistance in accessing community resources, and a chaplain to provide spiritual support. Basic procedures such as obtaining lab samples and dressing changes, along with teaching in the home. Coordination of home care, hospital, clinic, and community services to ensure continuity of care and support over time. Experience and expertise in helping children with complex care and symptom management needs. Compassionate spiritual and emotional support for children and families. What is palliative care? How does it differ from hospice? Hospice care is defined as care of patients in the last phase of an incurable disease so that they may live as fully and comfortably as possible. Palliative care is a discipline that is devoted to achieving the best possible quality of life throughout the course of a life-threatening illness, through the relief of suffering and the control of symptoms. In children with life-limiting illnesses, it is often difficult to predict the outcome until death is imminent. What do you mean by a comprehensive palliative care program? Palliative care is provided by an interdisciplinary team, which may include physicians, nurses, social workers, chaplains, pharmacists, child life workers, counselors and others. The unit of care is the child and the family, and the palliative/hospice services are provided in a setting that is appropriate to their needs and wishes. Does the Mariposa program accept patients around the state, or only those children being treated at UNM? Our goal is for every terminally ill child in New Mexico to receive comprehensive palliative care and hospice services, whether they are at UNM or in local communities around the state. 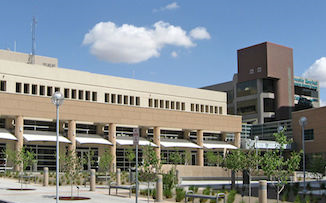 The Mariposa team provides direct patient care within a 60-mile radius of Albuquerque. For patients from other areas of New Mexico we work to support local hospices, primary care physicians and home health agencies in caring for the child and family. What specific things, besides pain and symptom management, can I do for my patient on hospice? Oversee the care to ensure continuity and to promote quality of life as defined by the patients and family. Discuss end of life goals with patient and family (including DNR, when appropriate). Facilitate communication between the parent and the child, including the child in the discussion as much as possible. Listen compassionately to the fears and concerns or to the patient and family members, and answer their questions fully and respectfully. Give explanations in clear, simple language, recognizing that you may have to give the same explanation several times. Accept cultural and religious perspectives about illness and death which may be different from your own. Acknowledge the child's and family's strengths. Don't hide your own feelings to protect the family. The Mariposa Team is pleased to offer presentations throughout the state for anyone involved in the care of a child diagnosed with a life-threatening illness. Presentations utilize case studies to address issues related to pain and symptom management, psychosocial and spiritual needs of the dying child and his or her family, and bereavement concerns and practices. Please contact us at 272-6700/toll-free 866-869-7243. This is a quote from Mattie Stepanek, who wrote and published six books of poetry. Mattie’s life, as a poet, a peacemaker, and philosopher, died of Muscular Dystrophy at the age of 14. This quote represents our Mariposa team philosophy in caring for these special patients and their families.